If you’ve been following the latest in fashion news, then you know that iconic American fashion designer Betsey Johnson has filed for bankruptcy and plans to close over three hundred of her boutiques worldwide. Though the news is unfortunate for the designer, fashionistas all around the world get to profit from slashed prices. And with prices this good, things are sure to be going fast! 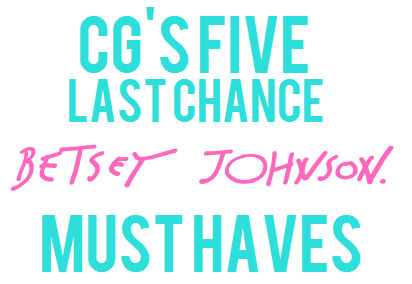 If you’re looking to score some Betsey Johnson designer goods, here are five must-haves from her online site sale. There is nothing better than accessories that can dress up the simplest of outfits, and this Rhinestone Bow Stretch Ring is an ultimate must have. 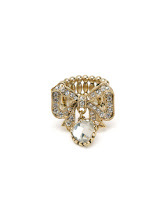 This one-size-fits-all statement ring is a real jewel with its encrusted rhinestone bow face and is the perfect accessory to put a little bling in your day. A little goes a long way...throw on a pair of jeans and a tee and set this ring off with metallic-colored nails or French tips. If you’ve ever played the game “What’s in Your Bag?” and weren’t too enthused about what was actually in your bag, you’re in luck! Every once in a while a girl needs a good set of tweezers, and with a pair like these adorable white Betsey Johnson rose printed tweezers, you’ll want to take them everywhere. 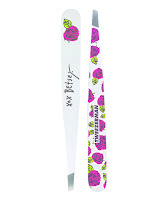 If roses aren’t your thing and you are looking for a bit more rocker edge, there are also Betsey Bones Tweezers that feature white skulls on a pink backdrop. Always on the go? Don’t be caught running your daily errands without this black and pink wristlet wallet. 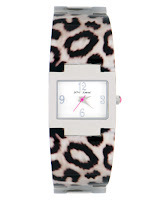 The color palette is classic Betsey and the straps are almost reminiscent of the icon’s regular use of zebra stripes. The Joico Wallet is also available in an all black look. If you have the means, grab both looks for a quick day-to-night change. With this stylish time piece, you can take being “fashionably late” to a whole new level. 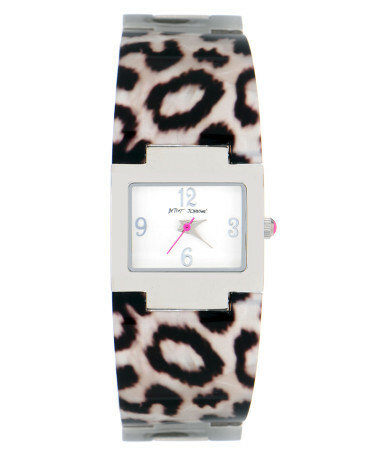 This watch is decked out with a sleek face framed in stainless steel matched with a leopard printed band. With this added to your ensemble, any outfit can go from casual to chic in a matter of time! Itsy bitsy teeny weeny polka dot bikini...and a cute one at that! The only thing better than getting something on sale is getting two things for the price of one, and if you agree, you’ve just hit the jackpot! This piece sports not only pinwheel flowers, but reversible triangles allow you to change your look whenever you want. It’s the summer, and if you haven’t gotten your swimsuit yet, what are you waiting for? While these are our must-haves from Betsey Johnson’s online sale, there are certainly just as many other exciting items in both the boutiques and online, so be sure to check it out! Are you taking part in the sale? We are, and since we’ve shared with you some of our favorites, tell us what your Betsey Johnson must-have is. Join in the discussion! And you can even submit an outfit with one of your favorite Betsey pieces!